On Tuesday, October 16th, citizens, NGO activists and civil servants met at the Irish Human Rights and Equality Commission in Dublin to discuss the United Nations’ promise to Leave No One Behind in national and international efforts to reach the targets for the UN’s 2030 Agenda for Sustainable Development. 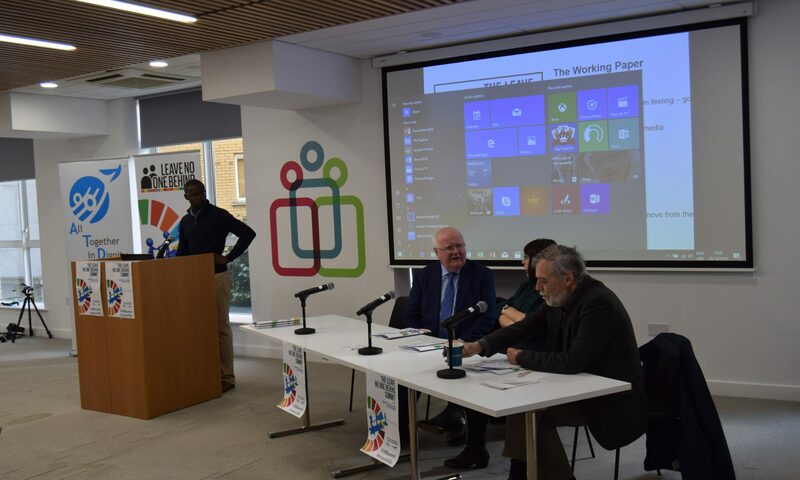 The Leave No One Behind Summit was the final event of a grass-root consultation process facilitated by All Together in Dignity (ATD) Ireland and supported by Concern Worldwide. From April to September 2018, ATD ran a series of 15 “Leave No One Behind” conversation workshops in Dublin, Donegal, Longford and Kildare. Summit attendees agreed on certain recommendations to be brought to the second SDG Stakeholder Forum held on Friday the 19th of October, facilitated by the Department of Communication, Climate Action and Environment. It was also suggested, as away to mark the UN End Poverty Day, to call on presidential candidates to share a “Leave No One Behind” public statement before the second Irish SDG Stakeholder Forum. Pierre Klein from ATD Ireland, who organised the Summit said: “We are now three years into the timeframe world leaders set for the implementation of the ambitious plan that should see the achievement of the Sustainable Development Goals by 2030 and the delivery of the “Leave No One Behind” promise. Will the “furthest behind” inspire the actions and leadership of the next Irish President? The participants in the Summit yesterday agreed that each candidates should be asked to tell to the Irish citizens how they will act as champion of the UN Plan for a fair and sustainable future for our children. What is also needed is a clear statement about their approach to the transformative “Leave No One Behind” promise. As we are 10 days away from election day, it would be appropriate to have this public statement as soon as possible, preferably before the 2nd Irish SDG Stakeholder Forum taking place this Friday”. Participants in the Summit, including members of NGOs such as ATD, Concern, Social Justice Ireland and the Dochas Network discussed the Leave No One Behind Conversations Working Paper presented by ATD Ireland. The Summit took place on World Food Day, also named “Zero Hunger Day” and just before the International Day for the Eradication of Poverty (www.17october.ie) also named UN End Poverty Day. The patron of the Summit is the former Irish Ambassador to the United Nations’ David Donoghue who co-facilitated in 2015 the historic adoption of the plan to secure a better future to people and the planet: the Agenda 2030 for Sustainable Development. This agenda adopted by Ireland and 192 other countries includes a “Leave No One Behind” promise: “As we embark on this great collective journey, we pledge that no one will be left behind. Recognizing the dignity of the human person is fundamental, we wish to see the Goals and targets met for all nations and peoples and for all segments of society. And we will endeavour to reach the furthest behind first.” states the preamble of the Agenda.